in only six weeks when used with round or triangular liners. How do teats get damaged? 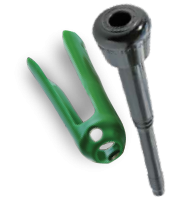 Teat damage is due only to milking machines using poorly set milking equipment. Teat damage occurs predominantly at a teat's end and is due to a lack of effective rest phase. 3. Secretion of excess keratin from the cells around the teat end which is a physiological reaction to protect the teat canal. Continued secretion of keratin results in thickening of the teat canal and slowing of milking and teat "growth"
Question : How can we reduce the machine milking damage to teat ends? 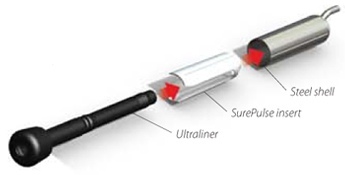 SurePulseTM inserts slide in and locate between the liner and the shell. 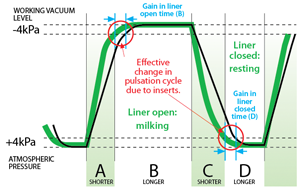 Using SurePulseTM inserts produced statistically significant improvements in teat-end condition after only six weeks milking. Features shorter A and C phases. B and D phases become longer. featuring shorter transition phases and longer milking and rest phases. featuring long changing cycles and reduced milking and resting phases. NOTE: This graph and the information pertaining to the graph is representative for the average of a number of trial conditions. In practice the exact result will vary in various applications. The opening phase must be smooth and ideally between 90-130 milliseconds. Open liner and full milk flow - ideally extended to about 490 milliseconds. A longer phase allows faster milking. Ideally, the closing phase should be 80-100 milliseconds. The rest phase with closed liner. The lymph and blood material in the teat is circulated back to the udder. It is critical that this phase is not less than 150 milliseconds. Greater than 250 milliseconds is ideal. Phases B and D can be changed with pulsator adjustment but phases A and C cannot. Note that in phase A air is removed from the pulsation chamber and in phase C air is circulated in the pulsation chamber. 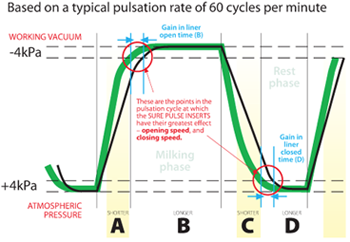 Phase A requires more energy to achieve than phase C.
We can modify both phase A and phase C by displacing air volume. 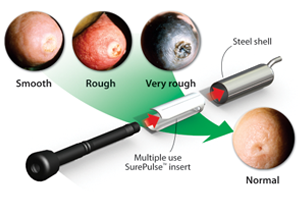 This is the function of SurePulse inserts.